The Department of Agriculture, Environment and Rural Affairs (DAERA) has today issued advice to farmers as the closed spreading period comes into effect from midnight tonight. A DAERA spokesperson said: “The closed spreading period comes into force from midnight 15 October 2018 and runs until 31 January 2019. It is a mandatory requirement of the Nitrates Directive and the ultimate aim is to protect water courses from pollution. “The closed period prohibits organic manures, including slurry, poultry litter, sewage sludge and abattoir waste, from being spread from 15 October to 31 January. Farmyard manure must not be applied from midnight 31 October to 31 January. These periods represent the time when the risk of nutrient leaching is at its highest and there is little or no plant growth. 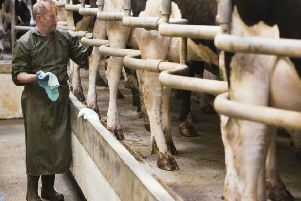 “All farmers are required to have at least 22 weeks slurry/manure storage for their livestock enterprises. Pigs and poultry enterprises require a minimum of 26 weeks. Having enough tank capacity gives the ability to store organic manure until the closed period has ended and have flexibility in the timing of spreading if conditions are unfavourable in early spring. “However under exceptional circumstances, beyond the control of and not foreseeable by an individual farmer, a limited amount of slurry can be spread during the closed period. If slurry must be spread during this time, evidence must be available to demonstrate to NIEA that all reasonable steps were taken to manage the situation, and that there was no alternative. If farmers have concerns they are advised to contact DAERA on 0300 200 7842 or their local farming organisation.